Sometimes creating simple projects for seasonal pieces is the way to go. 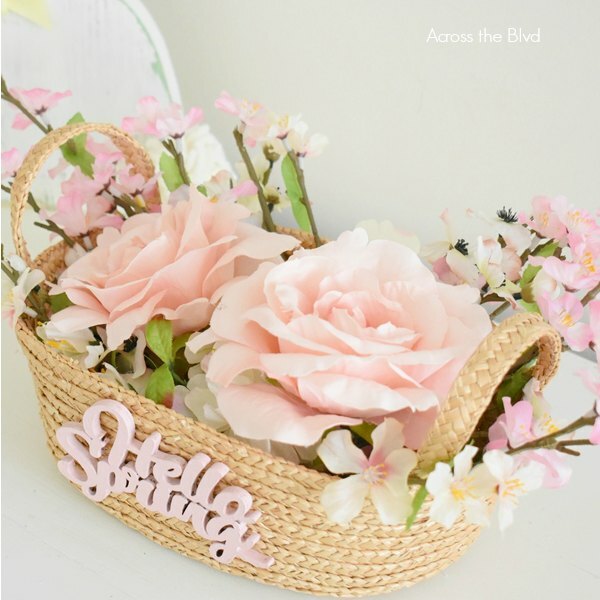 This Hello Spring Floral Basket is a pretty addition to my spring decor and it only took minutes to put it together. 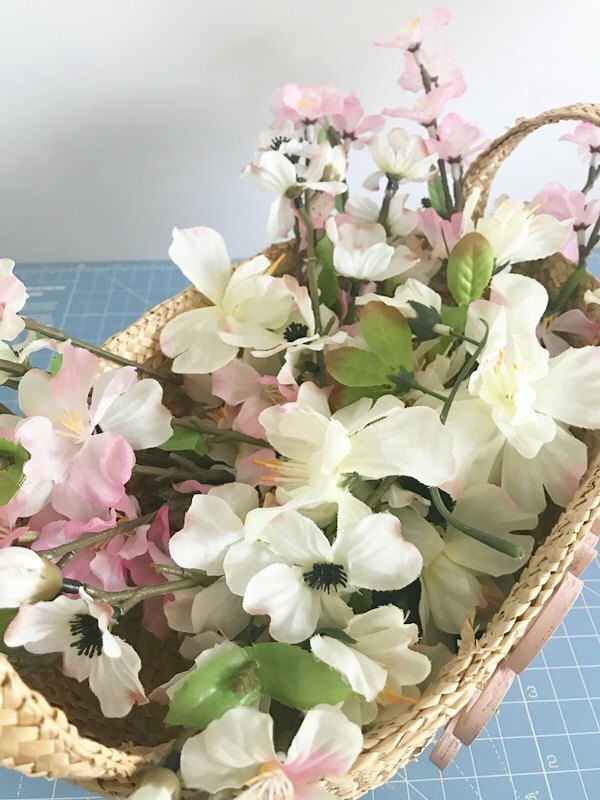 While I love having fresh flowers, I often use faux blooms to create decor pieces that I want to keep on display for longer than fresh flowers would last. 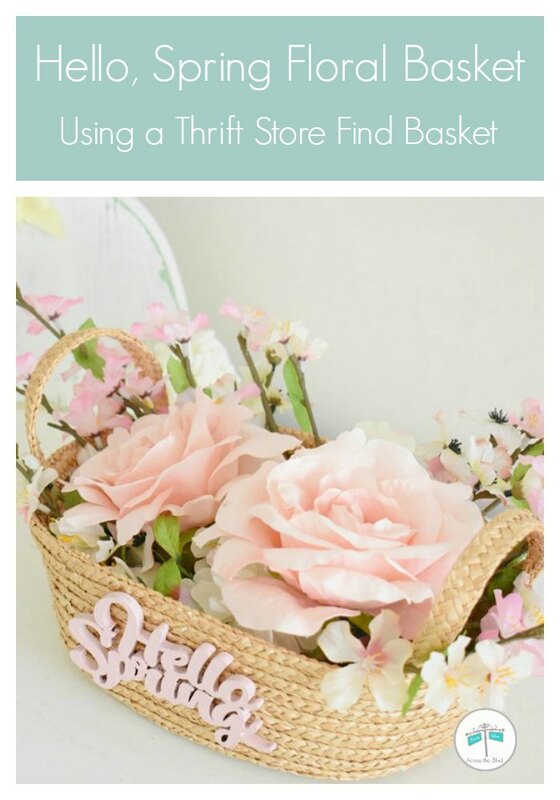 Just like with my inability to pass up a unique thrift store frame like I used for my Easy Easter Vignette, I find it hard to pass up baskets when they are in good condition. This simple basket caught my eye because of the handles. Fortunately, the big bow was simple tied on and not glued to the basket. 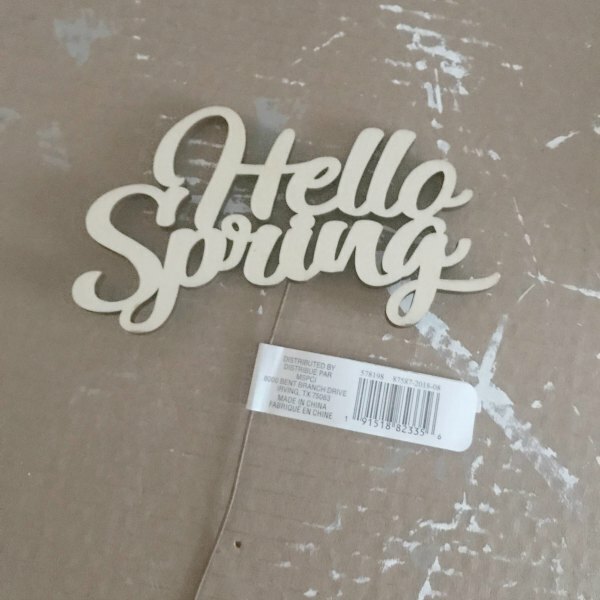 I gave the Hello Spring craft wood pick I found at Michaels a coat of Waverly Chalk Paint using Ballet Slipper Pink. I used floral wire cutters to remove the metal pick. While the paint dried, I trimmed and arranged the flower stems in the basket, laying them in opposite directions. These were all flowers I had in my craft stash. I bought the large blooms at Michaels to fill the center of the basket and to add a nice contrast to the smaller flowers. I trimmed the stems of the large flowers down to about three inches so that they could be nestled into the other flowers. Once the hello spring sign was dry, it was hot glued to the basket. How simple was this? I love putting together inexpensive, simple seasonal decor that turns out to be a pretty decor piece. 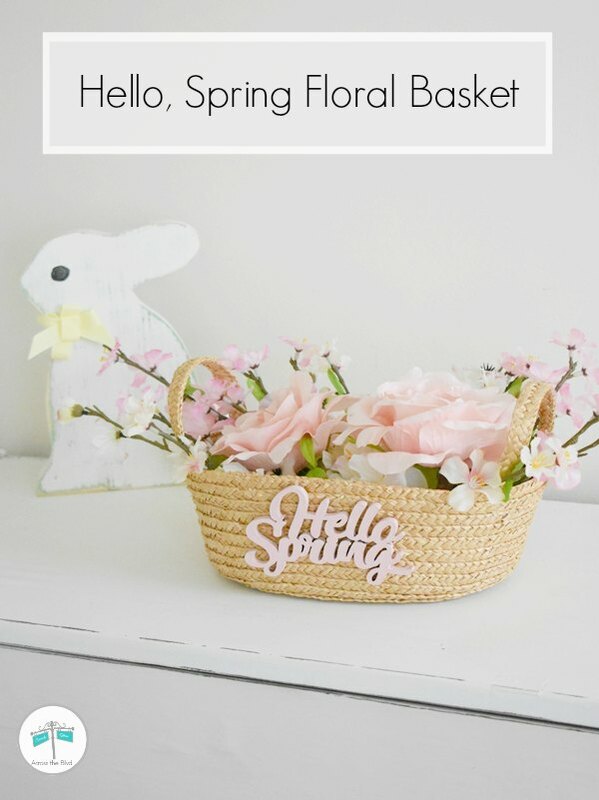 I think you’ll enjoy these easy spring time posts, too! Thank you, Marie! I love simple projects like this. Thanks for pinning! I love the shades of the colors of the flowers. Thank you, Calleen. I’m enjoying the soft hues of pink, too. Beverly this is such a simple idea with such a big impact for a room. I think I have a basket somewhere that I can use to do this too. Thanks for the inspiration. Thank you, Mary. Sometimes simple projects are the best! I’m delighted to have given you an idea! Thanks for the party, Marilyn. I appreciate the pin and shares. Thanks, Julie! That little sign is a cute one. It looks great in your centerpiece, too. Your projects are always so pretty and creative using everyday items! You have quite a special knack for this! What a nice thing for me to read, Gail. Thank you! I really appreciate that. I love your flower choices! That bow is adorable. Thank you, Terri. I’m enjoying the pretty pink flowers. wow! This basket is beautiful. Such soft and pretty colors, it has spring written all over it. What beautiful flowers. Thanks, Jenny! 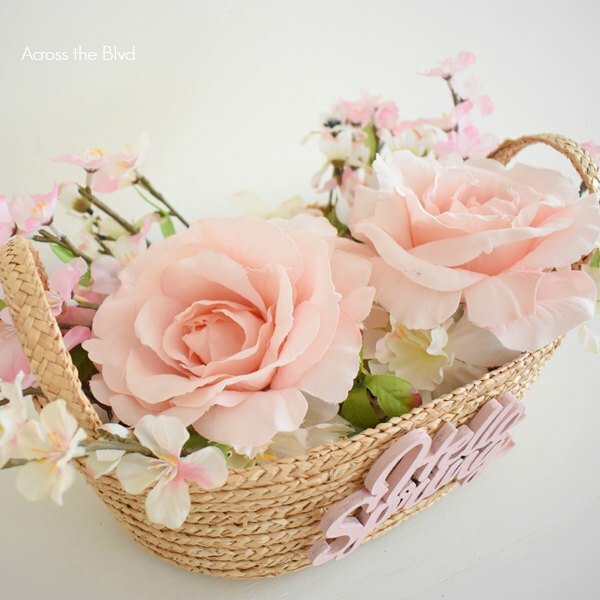 I loved the little basket and filling it with flowers from my stash was an easy way to make it pretty. Congrats, you are being featured at Wonderful Wednesday blog hop. 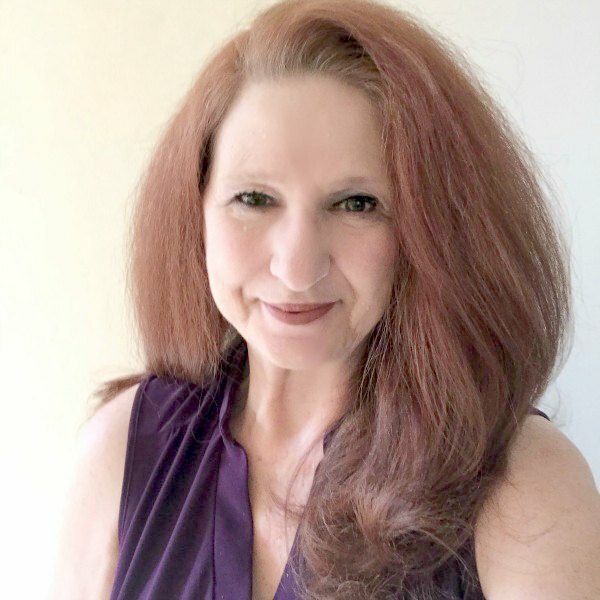 Thanks so much for the feature, Bev! Your Little basket turned out adorable, Beverly. I love the colors! I’ll be featuring you tomorrow on the Thursday Favorite Things Party! Thanks so much for always being such an inspirations and leaving your your wonderfully kind comments. Big hugs for a wonderful weekend. Thanks so much for the feature, Theresa! I appreciate it. I hope you have a lovely weekend. I love your pretty spring basket! I was happy to feature you at TFT this week. Thanks for sharing! 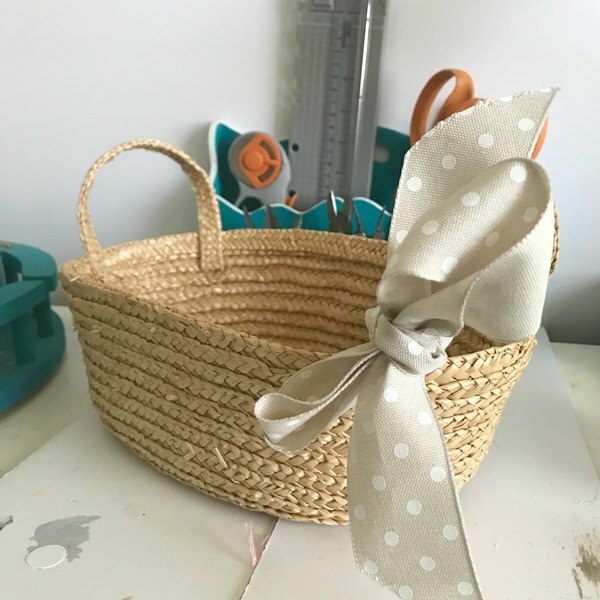 This basket is so pretty and a great idea for table decor.Thanks for sharing at the welcome spring link party, I’ll be featuring this today in my features post.